The visuals and deeply moving storytelling make “Coco” one of the best pictures Pixar has ever produced. Rating: 4 stars out of 4. 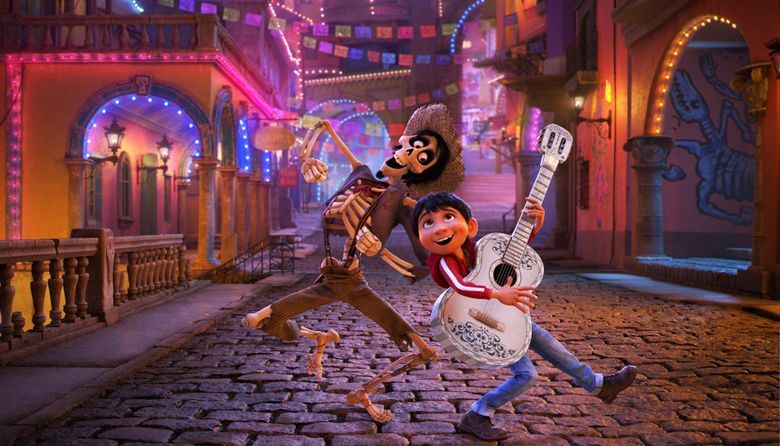 In Spanish, it’s “heart.” And in “Coco,” it’s heart that’s overflowing with love, poignancy, humor, color and music. Such rich, glowing colors. 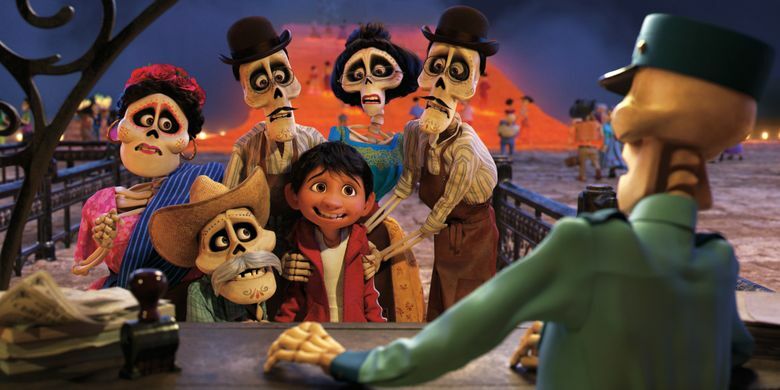 You can lose yourself in “Coco’s” extraordinary imagery. ‘Coco,’ with the voices of Anthony Gonzalez, Gael García Bernal, Benjamin Bratt, Alanna Ubach, Renée Victor. Directed by Lee Unkrich and Adrian Molina, from a screenplay by Molina and Matthew Aldrich. 109 minutes. Rated PG for thematic elements. Several theaters. Such rousing, touching music. Set-piece production numbers drive the narrative while they uplift the spirit. Set in a village in rural Mexico, “Coco” is a celebration of that country’s culture, particularly the close connectivity of generations. The title is the name of the great-grandmother of the central character, a high-spirited, music-mad 12-year-old boy named Miguel (voiced by Anthony Gonzalez). Four generations live under the family roof, and the kid is very close to his Mama Coco. Rendered nearly mute by the infirmities of advanced age, she seems a peripheral figure at first. But the fact that the movie is named for her is a key clue to a mystery that is central to the story. The tightness of the generational connectivity stretches beyond the living to the dead. Departed ancestors — whimsically rendered skeletons — are vividly present on the Día de Muertos holiday, when the picture takes place. They cross from the Land of the Dead — a spectacularly rendered confection of towering, brightly lit buildings — to the Land of the Living on that special day via an immense bridge made of sparkling orange marigold petals (a stunning sight). There, they mingle with the living at the village cemetery. A flash of accidental magic sends Miguel across the bridge to the Land of the Dead, where he encounters the spirits of departed forebears, along with his musical idol, vainglorious musician/actor Ernesto de la Cruz (Benjamin Bratt), and a fast-talking clownish bag of bones named Héctor (Gael García Bernal). It’s Héctor who is the source of much of “Coco’s” humor, literally falling to pieces on several occasions and then awkwardly reassembling his wayward bones with lightning speed. But appearances are deceiving. The clown is actually a tragic figure who is slowly fading away because if the dead are no longer remembered by the living, they vanish for all time. Héctor’s sole link to the Land of the Living is a tenuous and increasingly fragile one. This theme that the dead live on through the memories of the living gives “Coco” its poignant power, and that power makes this movie uniquely memorable.